Perhaps one of the most well-known pieces of music in the world, this composition is a common catalyst and inspiration that causes many people to become interested in the piano. The first few notes are instantly recognized by most people who may even be able to play them, and the entire first section is often taught to students starting out. The number of people who can master the entire piece is significantly smaller because of the intricate control of touch and emotion it requires to come out right. Für Elise (which is German for For Elise) was composed by Ludwig van Beethoven around 1810 when he was 40 years old and firmly established as one of the greatest composers in history. It is named "Für Elise" because a Beethoven researcher named Ludwig Nohl claimed to have seen this dedication on the original autograph which has been missing since, and this has been the cause of some speculation. The piece was not published until 1865 well after Beethoven's death in 1827, and no distinct records, letters, or accounts from people at the time make mention of an "Elise" in the composer's life. Beethoven was in love with a woman named Therese Malfatti around the time he created the work, and one of the theories that has circulated for a long time has been that Ludwig Nohl misread the composer's poor handwriting which then would have said "Für Therese". That's quite a stretch in my own humble opinion. It is also unreasonable to expect that all aquaintances from 200 years ago can be accounted for, especially when the subject is a man who increasingly withdrew himself from the world because of his hearing loss. In 2009 a Beethoven researcher named Klaus Martin Kopitz made the claim that "Elise" may have been the nickname of opera singer Elisabeth Röckel whom the composer met a few years prior to writing the piece. The two enjoyed a close friendship according to stories told by Röckel herself, but she would later marry Beethoven's on-and-off friend and rival Johann Nepomuk Hummel. According to Kopitz, the church records for the christening of Röckel's first child in 1814 give her own name as Maria Eva Elise. He found the records in St. Stephen's Cathedral in Vienna, suggesting that Röckel may indeed have been known as "Elise" at least in Viennese circles. After researching this piece I also came across other theories to explain the dedication, although I am personally quite intrigued by the recent discoveries of Kopitz. One less well documented theory claims that the name "Elise" was used as a general term for "sweetheart", but I have been unable to substantiate this claim despite seeing it a few places. 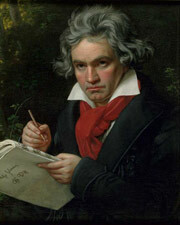 In my own opinion it would not fit well with Beethoven's composing and dedication history. However, whether Elise was misread, a known or unknown love or a woman who simply inspired Beethoven to write this piece, it remains one of many unsolved mysteries left to ponder. It is interesting to note that Ludwig van Beethoven re-visited the piece in 1822, but it remained as sketches that were never released in his lifetime. The intentions behind picking up the work more than decade later are not known. While the revised version appears somewhat incomplete there are significant changes to the accompaniment as well as new material added.